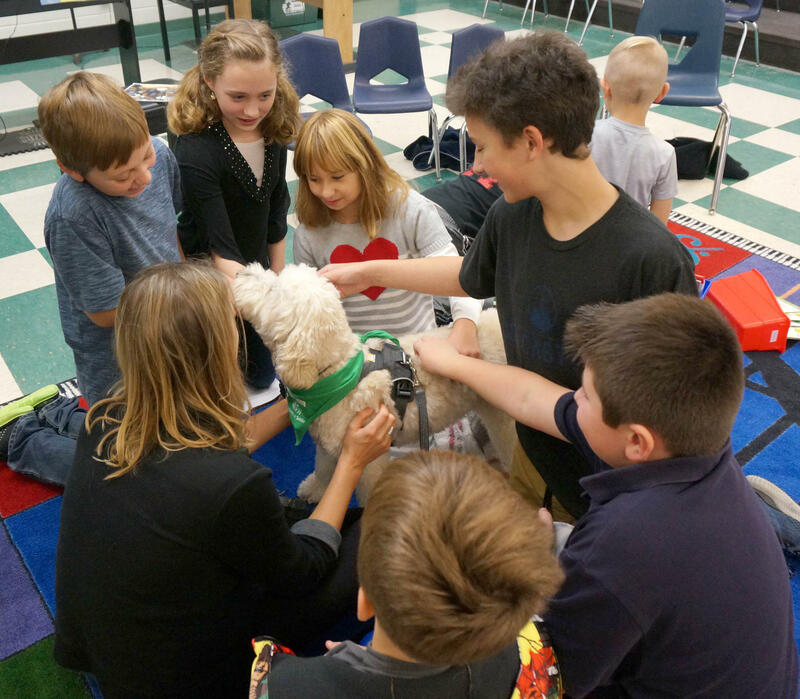 A four-legged friend stopped by to spend time with first and fifth grade reading buddies at Chamberlin School in South Burlington — a timely visit, as the older students had recently read about a supportive dog in Paul Griffin's novel When Friendship Followed Me Home. 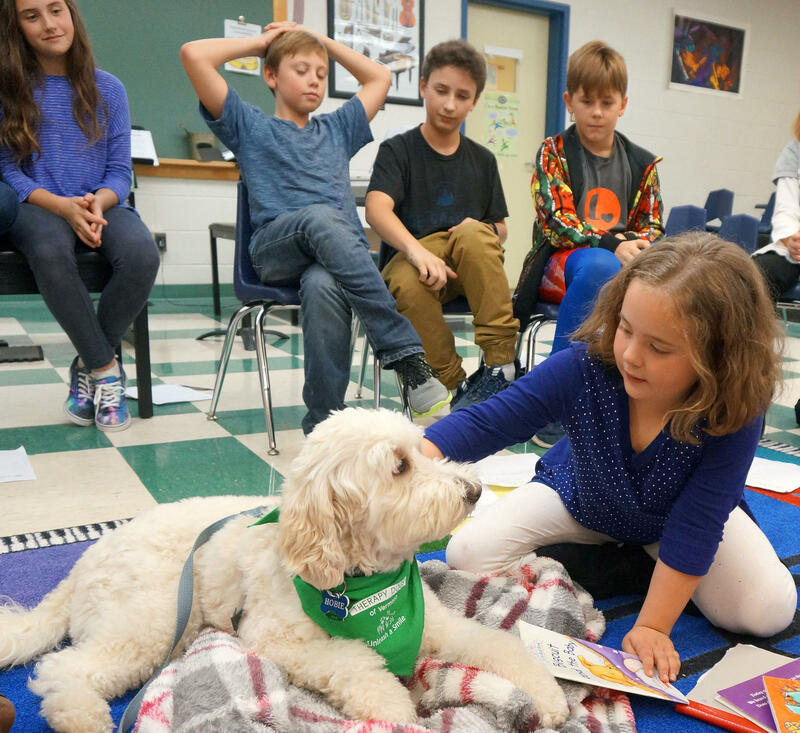 On a November day, first grader Felicity Barras is reading to some fifth graders, but also therapy dog owner Sarah Genest and her mini goldendoodle named Hobie. Hobie pays close attention to the story — that's part of his job as a therapy dog. While Felicity and some of her classmates have been reading to Hobie, the fifth graders have been reading about a dog named Flip with some of Hobie's same skills in Griffin's novel. The book is a current nominee for the Dorothy Canfield Fisher Book Award, and it takes place on Coney Island, where Ben, a former foster kid, lives with his new mom. Ben likes books, and one of his favorite places is the Coney Island Library. It’s outside a back door to the library where Ben first meets Flip. Flip the dog becomes one of Ben’s best friends, along with Halley, the librarian’s daughter. A lot happens in When Friendship Followed Me Home, and some of it is pretty heavy stuff — Halley has cancer, and Ben is getting bullied at school. Sarah Genest and her mini goldendoodle Hobie get to know a group of first graders at Chamberlin School, in South Burlington. With so much to take in, one Chamberlin School fifth grader wondered what the author felt the book’s big takeaway should be. Isaac Nicholson: "What is the theme for your readers to walk away with? 'Cause I can relate to so many of the themes that you put in there, and is there one theme that you really wanted readers to walk away with?" "Kate is the kind of person who would adopt a stray dog, or a person for that matter. And she adopts my characters like they’re her own kids. And we work on stories together for years. And for this one, we worked on it for about four years. "'Well, what is it about friendship that you think that we were doing here in the book?’ I said. "So, I would be happy if that came through." First-grader Felicity Barras gives Hobie a pat after reading him a "Biscuit" book. The book starts out with a bully named Damon Rayburn picking on Ben in the lunch line at school. By the end of the book, we see where some of that character’s mean spiritedness comes from. And one fifth grader was curious about the character's development. Sawyer Van Ornum: "I was wondering where you got your inspiration for Rayburn because in the book he seems like he’s a changing character. And even though you might see him as a bully, he seems like he’s influenced by his cousins." Griffin says he has some experience being around kids like Rayburn. Paul Griffin: "Hey Sawyer, thank you for asking about Rayburn. You know, nobody ever asks about him and I always feel bad for Rayburn. He’s had kind of hard luck in life and it’s nice that you thought of him. "Well, I started working with kids in juvenile detention centers back in 1989 — so what is that, 28 years ago. And the thing that I have come to learn about kids who are locked up is that they are kids. "Just like you. Just like I was. And, due to circumstances, and sometimes choices that they make or have to make, they end up with some pretty bad luck and with lack of freedom." Paul Griffin is the author of "When Friendship Followed Me Home." Griffin answered questions from Chamberlin School students about the novel, a nominee for the Dorothy Canfield Fisher Book Award. And while it seems like Rayburn is headed down that path, Griffin says he may learn to make some better choices as he grows up. One fifth-grade student wanted to know if readers will get a chance to find out what happens to characters like Rayburn, and especially main character Ben. Emma Severance: "Will you ever make a sequel to When Friendship [Followed] Me Home?" Paul Griffin: "I've never written a sequel. I’ve always done what are called one-offs. You build a little bit of a world, in a particular neighborhood, maybe where you’ve lived or where you’ve worked. And the people from your life start to come into that place … and also, they come into the time. They come into a place in time. "In this case, when I was 11 and 12 – I think a lot of the things that Ben has to handle in When Friendship Followed Me Home, I was dealing with too. So, the 11- and 12-year-old that I was … that influenced not so much the plot — it influences the characters first. And then the characters drive the plot." Another fifth grader expressed a desire to read more of the author's work. Griffin Preska: "I think this is such a great book because it made me think about how I would feel if any of the changes in the book actually happened to me. And I was wondering if you were going to write any more middle school-aged books that we could read." After reading time is over, the fifth graders get their chance to show Hobie some love. The author says his newest middle grade book just came out. It’s called Saving Marty. Paul Griffin: "And that one's about a pig who thinks he's a dog." And Griffin says he thinks fans of When Friendship Followed Me Home will enjoy the new book too. Paul Griffin: "It's got that same feel to it. You know, that animals are beautiful companions and beautiful friends, no matter what. When things are great, they’re happy to celebrate with us. And when things are challenging, they're there. They never leave our sides." Griffin’s love for animals also inspired these Chamberlin School students to do something for homeless pets in Vermont. They held a popcorn sale at school as a fundraiser. “We raised money for the Humane Society," explains fifth-grader Sara Hegarty. "And I was proud of it, 'cause we raised about $100?" — some of Sara's classmates jump in to clarify that they actually raised even a little bit more: $108 total. "And we gave it all to the Humane Society to help dogs like Hobie and all the animals that need homes," Hegarty continued. And with Hobie’s visit, the giving between students and animals came full circle at Chamberlin School. Find more episodes of Dorothy's List here. Special thanks to library media specialist Cally Flickinger and Sarah Genest and, of course, her dog Hobie. About a hundred students from elementary schools in Swanton, Highgate and Sheldon packed into the children's room of the Swanton Public Library on a recent Friday the 13th — a fitting date to welcome author Marina Cohen to talk about her spooky novel The Inn Between. In the book The Wild Robot, a robot named Roz washes up on a remote island and must learn survival skills. Northfield Elementary School students recently gathered in their school library to show off what they learned about the book by way of a friendly trivia competition. The War That Saved My Life, by author Kimberly Brubaker Bradley, is a World War II-era story about a girl and her brother who have a chance to escape their cruel childhood when London is evacuated during the war.